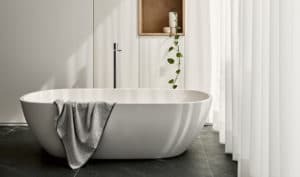 If you’re looking to add value to your home before putting it on the market, one of the key areas to focus on is your bathroom. Whether it’s a fresh coat of paint or a full makeover, there is always space to improve in your bathroom. Bathroom renovations and additions can help increase your home’s value, but remember to keep it simple. Here are our top tips for a value-adding makeover. People often fall into the trap of going overboard with items like patterned tiles and eccentric taps. Remember, not everyone has the same style interests as you, and it could put off a potential buyer who wants to move into a ready finished home. Sticking to mainstream and tasteful features will serve you better. A cracked tile can be more ominous than it seems. Cracked or damaged tiles can allow water to get into areas where it is not supposed to go. Water that is allowed to get behind the wall or floor of the shower can lead to damage to the substrate, discolouration of tiles and weakening of tile adhesives that can eventually causing tiles to break away. The longer cracked tiles are left unfixed, the greater the risk that significant structural damage may occur. Cracked or discoloured tiles can be a symptom of a superficial problem or more serious structural issues. Where and how your tiles are cracking is a key indicator. Do your tiles have small cracks on the tile edge, cracks in the tile corners or hairline cracks in the glaze? Or have they cracked in a straight line across multiple tiles on the floor or wall? These are questions we can help you with so you can ensure that there are no nasty surprises that may crop up in your buyer’s property inspection. You may think your DIY skills are pretty good, but a potential buyer may disagree. Poor workmanship can instantly change a buyers perspective of your property, especially things like uneven and crumbly grout, peeling silicone and damp patches. With over 15 years of experience in the industry, Perth Shower Repairs are experts in professional shower repairs. Locally owned and operated, we excel in providing the best service possible and highest quality solution for your shower. Using only superior-grade products, we guarantee the highest standard of workmanship and complete our work in accordance with Australian Building Standards. So before you make that trip to Bunnings, call in the experts for a free, no-obligation quote. If your bathroom isn’t in dire need of a makeover and just needs a breath of fresh air, then a fresh regrout could be all you need. At Perth Shower Repairs, we use top-quality German grout additives together with high-grade silicone to seal and waterproof your shower. Our grout removal equipment is German made and trusted by industry professionals worldwide. All our completed work is backed by a ten-year warranty for your peace of mind. If you’re looking to sell your home soon and think we can help you add value with some bathroom TLC, then give us a call today. We offer affordable, fixed price packages which are based on common shower sizes and designed to make life easier when it comes to decision-making. Each package comes with optional add-on services, providing a comprehensive shower sealing and waterproofing package to suit your needs. Call Chris on: 0424 745 937 or request a quote today.